Ella Purnell adds a little pop to her black jacket with silver streamers in this shot from the new issue of Schon magazine. Miss Peregrine’s Home for Peculiar Children is out in theaters NOW. Miss Peregrine’s Home for Peculiar Children Is Tim Burton’s Best Film in Years! With the right strange, spooky material, a beloved director finds his way again. By my count, it’s been nine years since I liked a Tim Burton movie (Sweeney Todd: The Demon Barber of Fleet Street), and a whopping 20 since I loved one (Mars Attacks!). I had begun to think that I’d lost all affection for this talented, wayward director, who conjured such bountiful, weird visions earlier in his career, and then seemed to get blinded by the empty gleam of studio C.G.I. What a nice surprise, then, to watch Burton’s new film, Miss Peregrine’s Home for Peculiar Children, and feel a stirring of that old Burton love—to find his dark whimsy (which had begun to seem a bit faux-dark of late) fresh and vibrant again. There’s the old Tim Burton we all used to root for, amiably wandering out of the woods like he hasn’t been lost for a long time. Which, yes, is probably a pretty condescending way to start a review. But Burton’s artistry has been so misplaced for so long that it’s just really nice to thoroughly enjoy a movie of his again. Miss Peregrine is based on the popular novel by Ransom Riggs. It proves to be ample, sturdy source material—full of visual wonder and intriguing narrative loops—for Burton to build one of his big, multifaceted curios atop. The film is essentially the story of a teenage boy, Jake (Asa Butterfield, monotone but effective), who travels to an island off the coast of Wales to investigate his beloved late grandfather’s (Terence Stamp, playing sweetly against type) past at the titular home for children. But hidden within that traditional-enough narrative is an arresting, Burton-y brand of spiky melancholy, a wistfulness laced with menace that is equal parts shivery and poignant. Miss Peregrine is plenty silly, for sure. As the film goes, it builds toward yet another over-the-top climax full of goofy villains and unpleasant C.G.I. That sequence works, only barely, because Burton’s witty choreography manages to keep it aloft. But much of what comes before that bulbous (but still fun!) final stretch is grim and clever and, quite simply, vastly entertaining—just what one hopes for from a Tim Burton movie. As Jake gets to know the peculiar children of this peculiar house, led by the peculiar Miss Peregrine (Eva Green, masterfully doing her usual Eva Green thing, only flecked with a little more warmth and sadness), the film explores its terrain inventively. Burton’s hand is delicate here—each oddity and ability possessed by the children is presented with restraint. Miss Peregrine is big and busy, but it only rarely feels over embellished. The film mostly stays focused on its interesting story, with occasional digressions or pauses to appreciate some canny little flourish. Aside from the supernatural elements, Miss Peregrine serves as a decent, if rudimentary, coming-of-age story: Jack comes into himself in Wales, after living a muted, lonely life in Florida with his parents. The film is also a quietly perceptive look at a prickly father-son dynamic, with Jack joined on his trip by his uninterested father, played with a curious accent but a good deal of insight by Chris O’Dowd. There’s a nice little budding romance when Jack falls for one of Peregrine’s wards, Emma (the promising newcomer Ella Purnell)—who also, at one point, was the sweetheart of Jack’s grandfather. Yup! You see, Miss Peregrine is, most strikingly, a story about time and memory and the bittersweet process of growing up. Which are all big, broad, bleary themes that tend to work very well on me. With its crafty, if a bit confusing, use of time travel, Miss Peregrine meditates on an idea of arrested adolescence that is both appealing and tragic, a nifty notion of perpetual youth that begins to seem more grotesque the more the film forces you think about it. There’s a maturity, and a respect for the audience’s maturity, in the way Burton handles this double-edged topic. We’ve not seen that from him in some time—not even in his last film, the for-adults drama Big Eyes. Miss Peregrine has a genuine emotional intelligence to it. Burton casts his gaze largely on people and pathos while employing his usual elaborate, special-effects-laden kookiness to embolden the humanity at the film’s core. Which is kind of the opposite of what he’s mostly been doing for the last 20 years. I don’t want to oversell Miss Peregrine as some sort of ruminative mood piece about the human experience. It’s not. It’s a kid’s film, co-starring Samuel L. Jackson as an eyeball-eating mad scientist. But it’s the rare kid’s film that has a sense of risk and stakes and tension to it, that admirably dares to be violent and unsettling and sad. Those qualities have long been Burton’s bailiwick—but here, he finally synthesizes them together in a way that’s coherent and thoughtful. Miss Peregrine is a testament to finding the perfect material to match a director’s tastes, rather than trying for some hideous compromise, like Charlie and the Chocolate Factory or Alice in Wonderland. As Tim Burton’s best film in almost a decade, Miss Peregrine’s Home for Peculiar Children has an exciting air of rejuvenation about it. It’s confident and judicious with its peculiarities, while letting its heart and intellect—not Johnny Depp in a bad wig—be its stars. 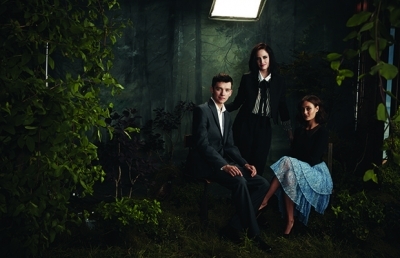 One of the biggest questions from Ransom Riggs fans was why the characters of Emma Bloom and Olive Abroholos Elephanta were swapped for the film adaptation of “Miss Peregrine’s Home for Peculiar Children.” Olive (Lauren McCrostie) is supposed to have an air peculiarity, but on screen she has fire. “I’m really glad you asked that because it’s something I do enjoy addressing,” actress Ella Purnell, who plays Emma, said during an interview. Emma and Olive aren’t the only differences from page to screen: Purnell noted how the ending is completely different, while Samuel L. Jackson plays an amalgamation of characters from the book in the form of Mr. Barron. “Miss Peregrine’s Home for Peculiar Children” is in theaters everywhere. The cast of Miss Peregrine’s Home for Peculiar Children came out to campaign for their latest film in equally compelling fashion. Directed by Tim Burton, the movie provides a glimpse into a fantasy world, not dissimilar to the setting for the premiere: the Saks Fifth Avenue flagship store in New York City. In addition to the cast and crew, guests including Zac Efron, Alysia Reiner, and Patti LuPone walked the red carpet lining the Fifth Avenue address before taking the elevator up to the eighth floor, perhaps more commonly known 10022-Shoe, for the after-party, where Café SFA chef Alex Reyes served up unexpected bites on trays in theme-appropriate winged shapes. We have added x131 photos to the gallery..